For Asset Owners, the ability to compare equity fund managers for hiring, firing, and allocation decisions lies at the heart of the investment decision making process. 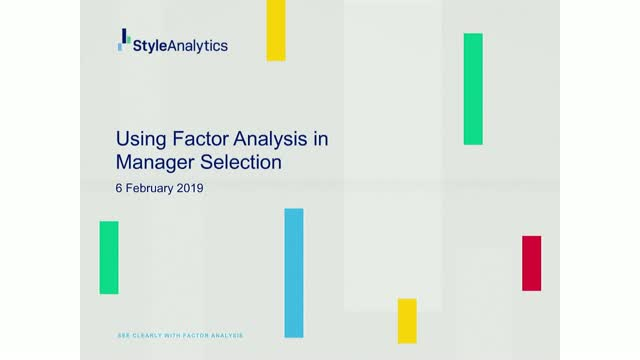 With the rise of both factor investing and smart beta products adding to the spectrum of equity funds available to investors, the decision to choose a new manager has become increasingly difficult. On the investment manager side, the current fee conscious environment and growing trend to move to lower cost index solution, is putting a strain on active managers. Now more than ever managers need to prove their skill and differentiate themselves from their increasing competition. The implementation of MiFID II at the beginning of this year brought dramatic changes to the way financial market participants work together. The unbundling of investment research fees from trade execution costs was cited as a strategic priority. Ten months on, are the European regulators achieving what they set out to do – transparency for end clients? Was the downside overstated in the run up to MiFID II? What opportunities has the regulation brought to sell-side and buy-side firms? How will all this play out? Join our webinar on October 9 with Gerard Walsh, Head of Business Development, Institutional Brokerage, Northern Trust Capital Markets to hear about the story so far and what lies ahead for firms in their Comprehend, Comply and Compete journey. The event will be hosted and moderated by Funds Europe’s editor-in-chief Nick Fitzpatrick. What are the main issues relevant to the Fund industry that have arisen from Base Erosion Profit Shifting (BEPS)? In this technical webinar, a panel of Fund, Tax and Legal experts discuss what Fund managers can do in anticipation of the EU’s Anti Tax Avoidance Directive (ATAD I), to come into force in January 2019. Please join us for this short video on advanced premia investing. What we at LFIS call "Premia 2.0". We seek to explain the underlying principles and concepts that are central to a modern premia investing approach. Taking more risk in the search for yield can be tempting, but investors must look past today’s low volatility to the longer-term. For investors looking to achieve sustainable yields, diversification will increasingly be key. Tomorrow many ways will be the only way. Join AXA IM’s Fixed Income CIO Chris Iggo on July 4, 2017 to discover the benefits of yield diversification. In a rising rate environment, investors looking to diversify may want to look at emerging markets bonds. The emerging markets bonds market has evolved significantly over the past two decades, growing in both size and diversity. Francis Rodilosso, Head of Fixed Income ETF Portfolio Management and Philipp Schlegel, International Business Development at VanEck will dive into various approaches to investing in emerging markets bonds, including current opportunities in local currency sovereign bonds. Join us for this pragmatic, action-based webinar where you’ll learn the details about the hot topics that will help you move forward in your PRIIPs integration. Hear from Singapore based Senior Portfolio Manager Kenneth Tang at Nikko Asset Management who will give insights into the economic outlook in South East Asia and discuss the continuous growth of the ASEAN economy. Nikko Asset Management is Asia's premier Global Asset Manager. The firm offers world-class asset management strategies and solutions for global investors, capitalizing on opportunities in markets around the world. Kenneth is responsible for managing Singapore, ASEAN, Balanced portfolios and covering the resources sector in Asia. He has extensive experience in equity long only and equity long short capacities as well as in commodity research. Prior to Nikko AM, Kenneth was most recently the lead portfolio manager for PineBridge Investments in Singapore Equity and Balanced portfolios. Hear from Maybank, Malaysia's largest financial services provider, about the opportunities ahead in Asian markets. Maybank Asset Management has operations in Malaysia, Singapore, Indonesia and Thailand focused on Asian and Islamic investment solutions to both the retail and institutional segments. Join our webinar on 10 December to hear from three of Maybank AM's top investment specialists on the current and future prospects for Asian macro outlook, Asian equities and dollar bonds. Robin has over 15 years of investment experience in Asian Equities and has had experience managing both traditional long only and alternative funds. Prior to Maybank, Robin was with Pengana Capital, the Hedge Fund arm of National Australia Bank where he was an Executive Director as well as co-manager at the award winning Pengana Asia Special Events hedge fund. Kedar is responsible for equity investments, as a co-portfolio manager of the Akshayam Asia Fund at Maybank Asset Management Singapore (MAMS). He has over 20 years of experience on buy-side investing across Asia, with a strong sector expertise in Telecom, Utilities, Financials, Property and Energy. Rachana is responsible for Fixed Income investments, with particular focus on BlueWaterz and alternative fixed income strategies, at Maybank Asset Management Singapore. She has over 20 years of experience managing Asian local currency government bonds, corporates and foreign exchange. The event will be hosted and moderated by Funds Europe's editor-in-chief Nick Fitzpatrick. This is a webinar suitable for investors interested in the developments of the South East Asian markets across sectors. What is driving global equities at the moment, and where are the best places to buy them? World stocks have been popular as a means of providing good returns while other asset classes offered low yields. But in recent months, equities have been falling on concerns over Chinese growth and a possible Fed rate rise. Join our webinar with Chris Hart, portfolio manager of the Robeco Boston Partners Global Premium Equities fund, to find out what are the latest developments. Chris will be available to answer questions on where global equities are heading, what are his favored regions, and how he applies his investment principles to his own global fund. The Robeco BP Global Premium Equities fund has outperformed consistently since its inception. It was recently awarded a Silver Rating by Morningstar, which had already given the fund a record nine Morningstar awards across Europe in the Global Equity category in 2014. Chris Hart has 22 years of experience in asset management, research and finance. Based in Boston, he is a portfolio manager for the global and international equity products. Prior to this he was an assistant portfolio manager for the firm’s small cap value products for three years. He joined Robeco from Fidelity Investments, where he was a research analyst specializing in conglomerates, engineering and construction, building, machinery, aerospace and defense, and real estate investment trusts (REITs). Global Funds Series includes 60-minute webinars during which fund managers from Asia, Latin America and the US present investment opportunities and their fund ranges distributed globally. The next webinar in the series features Scout Investments, an American asset manager with more than $30 billion AUM. Scout Investments provides global institutional investment management services to institutional clients and advisors and offers its mutual funds to individual investors. UMB Financial Corp, Scout’s parent company, has offered investment management services since the 1920s, while Scout officially began to provide institutional asset management in 1982. In 2010, Scout Investments acquired Reams Asset Management. Since its founding in 1981, Reams has managed fixed income portfolios for institutional clients. In this webinar we will hear an in-depth insight into fixed income opportunities and on Scout’s fund range which is available to European and global investors. Toby Cromwell, EVP Global Distribution, has more than 28 years experience in institutional sales, consultant relations, and management with investment firms of all sizes. He is an expert in the complete institutional business development process. Mark M. Egan, CIO, managing director and portfolio manager at Reams Asset Management, is the head of the Scout Core Bond Fund, Scout Core Plus Bond Fund, Scout Low Duration Bond Fund and the Scout Unconstrained Bond Fund. Prior to joining Reams in 1990, Mark was a Portfolio Manager at National Investment Services of America. He holds the Chartered Financial Analyst (CFA) designation and is a member of the CFA Institute. UTI is India’s leading asset manager with a 50 year history and more than $40 billion under management. A research driven company, UTI has extensive experience in managing Indian debt and equity funds. Later this month, UTI will launch a UCITS fund investing in Indian equities, based on an award winning strategy. This strategy is managed by Ajay Tyagi, an equity portfolio manager, based in Mumbai, with UTI. In this webinar, Ajay will give insights into India’s economy and political climate. He will also share his investment philosophy of the Growth At a Reasonable Price (GARP) and the current investment opportunities in Indian equities. An industry veteran, Ajay is part of the offshore funds team at UTI. He currently manages overseas assets of about USD 500 million in the equity arena, predominantly in multi-cap diversified funds with 50-60 percent allocation to large-caps and rest into mid and small-caps. He joined UTI in 2000 as an Equity analyst covering the Telecom and Media space and later became an Assistant Fund Manager in the offshore funds division before his present role as a Fund Manager. Ajay is a charter holder from The CFA Institute, USA and also holds a Masters Degree in Finance from Delhi University. In December Funds Europe sought the views of European asset managers with the first comprehensive survey on legacy systems. The results reveal just how much of a problem outdated technology poses. In this webinar we will discuss the results of the survey including: firms operational strategies, and the nature of their planned IT investment: the prevalence of legacy systems, the operational problems they create and the economics of replacing them; and the alternatives to legacy systems. Martin has been with Advent for 11 years and has worked in several senior sales and business development roles supporting the extensive business growth of Advent in the EMEA region. Prior to joining Advent, Martin worked as head of client relationships and portfolio manager at Danske Bank, Alfred Berg Asset Management and Nykredit Asset Management and served as director of pre-Sales at SimCorp. Steve provides a blend of business understanding combined with an extensive knowledge of the technology and software landscape along and in depth understanding of the services sector. Prior to joining Citisoft Steve was one of the team that created Rhyme Systems following a management buy-out from Misys PLC, successfully restructuring the business into a leading software and services company. Prior to Rhyme, he held senior positions at Thomson Reuters, Extel Financial and Datastream. Nicholas has been a financial journalist for 16 years. As technology and operations editor for funds Europe, he covers a range of operational and back office issues for the magazine. Previously he edited a number of business publications including Banking Technology, Risk Professional and Enterprise Risk, and has written for a series of titles including Financial Times and Financial News. Global Funds Series are 60-minute webinars during which fund managers from Asia, Latin America and the US present investment opportunities and their fund ranges distributed globally. This webinar features José Manuel Silva, CIO and Kevin German, Business Development Manager at LarrainVial Asset Management. Founded in 1934, LarrainVial, is one of the main financial institutions in Latin America recognized for the quality of its advisory services, history and the role it has played in the development of capital markets in the region. José Manuel Silva holds a Business Administration degree from the Pontificia Universidad Católica de Chile. He joined LarrainVial in 1997 as the Research Department Manager. Currently, José Manuel Silva is the Chief Investment Officer (CIO), and partner of Larraín Vial Administradora General de Fondos S.A. Previously he served as CFO of Santa Carolina, a leading company in the Chilean food and beverage sector. Between 1987 and 1991 José Manuel Silva was a Director at Toronto Trust Administradora de Fondos de Inversión, a closed-end investment company. Kevin joined LarrainVial Asset Management in 2013 and has since then served in the institutional sales team. Kevin holds more than 6 years of experience in the financial industry. He began his career in BankInvest Investment Management in Denmark, where he first served in the Operational Risk Team and later as a Fund Manager. He furthermore worked in the Securities Division of the Danish Financial Supervisory Authority (FSA). Kevin Holds a Masters degree, MSc in Commercial Law and Business Administration from Copenhagen Business School, Denmark. This webinar features Ricardo Kaufmann of BTG Pactual - a leading investment bank, asset manager and wealth manager with a dominant franchise in Latin America. With over 17 years of experience in the Latin American financial markets, Mr. Kaufmann leads the Latin American product development and investor relations efforts of BTG Pactual Asset Management division. He has extensive experience in the Private Banking, Asset Management and Brokerage industries, and a career that spans over major international organizations including Prudential Securities in Boston, Opportunity Asset Management, Bank of America in Sao Paulo, Poalim Asset Management in London and, most recently, Bulltick Capital Markets in Miami. Mr. Kaufmann is a frequent speaker at Fund Forums, Wealth management, Trading and Structured Products conferences in the U.S., Europe and around Latin America, as well as a Structured Products and Investidor Institucional Magazine contributor. Mr. Kaufman holds a Bachelor of Science Degree in Economics-Finance from Bentley University in Waltham, Massachusetts, and a Masters in Business Administration from Sao Paulo University in Brazil. This webinar features China Universal Asset Management - one of the top asset managers in China and of China-related assets that distributes a vast array of funds in Asia and Europe. Welcome to the Funds Europe webinar channel, a place for senior institutional investors, fund selectors, fund buyers, asset servicing professionals and fund distributors. Here you will find the latest thought leadership from global experts on institutional and retail markets, traditional and alternative investments, front and back office.